Ballerini grew up in Knoxville, Tennessee. Her father, Ed, a former sales manager for a country radio station, is of part Italian descent. Her mother, Carla, has worked in marketing for Thomas Nelson Bible publishing and a sponsorship company. She is an only child. She started taking dance lessons at Premiere Dance Studio in Seymour Tennessee when she was three and stopped ten years later. She sang in the church and school choirs. She wrote her first song at 12 for her mother and moved to Nashville, Tennessee, three years later. She attended Central High School in Knoxville, Tennessee; Centennial High School in Franklin, Tennessee; and then Lipscomb University for two years until she pursued a musical career. At 19, she signed a deal with Black River Entertainment. In late 2014, she released her debut single "Love Me Like You Mean It", which debuted on the Country Airplay chart in October 2014. She released a self-titled extended play for the label in November. She was named one of CMT's Next Women of Country in 2014. She performed for the first time at the Grand Ole Opry on February 14, 2015, and sang "Love Me Like You Mean It". On May 19, 2015, Ballerini's debut album The First Time was released through Black River. For the chart dated July 4, 2015, "Love Me Like You Mean It" , the album's first single, reached number one on the Billboard Country Airplay chart, making Ballerini the first solo female country music artist to score a number one hit with her debut single since Carrie Underwood did so with "Jesus, Take the Wheel" in 2006, and only the eleventh in history to achieve the feat. Ballerini also became only the fifth solo female country music artist to score back-to-back number one hits with her first two singles when "Dibs", the second single from the album, reached the top of the Country Airplay chart. She became the first to do it since Jamie O'Neal in 2001. The album's third single, "Peter Pan", was released to country radio on March 21, 2016. "Peter Pan" reached number one on both the Country Airplay and Hot Country Songs charts in September, making Ballerini the first solo female country music artist to top both country music charts simultaneously. This achievement also made her the first solo female to send her first three singles to number one since Wynonna Judd accomplished the same feat in 1992. The album's fourth single, "Yeah Boy", was released to country radio on October 10, 2016. In early 2017, Ballerini was named to Forbes' 30 Under 30 – Music list at number two. In 2017, Ballerini received two Academy of Country Music Award nominations for Female Vocalist of the Year and Video of the Year for "Peter Pan." In June 2017, Ballerini released "Legends" as the first single from her second studio album. On November 3, she released her second album, titled Unapologetically. The album debuted at number three on the Billboad Top Country Album Chart and number seven on the Billboard 200 Album Chart, making it her highest charting album on both charts. The second single from the album, "I Hate Love Songs", was released in March. In September 2018, she announced that she would be releasing a deluxe edition of the album with four new tracks. On September 18, 2018, EDM-pop duo The Chainsmokers released a song titled "This Feeling" featuring Ballerini. In the fall of 2018, Ballerini joined the fifteenth season of The Voice as the fifth coach. She coaches six contestants who did not get a chair turn during The Blinds, in a new round called The Comeback Stage. The Comeback Stage is a digital companion series to the show. The third and final single from Unapologetically, "Miss Me More", was released in October 2018. In October, she provided vocals on her husband Morgan Evans' song "Dance With Me". In December 2018, Unapologetically received a nomination for Best Country Album at the 61st annual Grammy Awards. On March 5, 2019, she was invited by Little Big Town to become a member of the Grand Ole Opry. Ballerini will embark on the Miss Me More Tour in support of Unapologetically in April. Ballerini has been influenced by both artists in the pop music and country music field. Originally influenced by pop music, Ballerini states "I grew up on top 40 pop. I didn’t know what country music was, which is so funny because I grew up on a farm in East Tennessee." Ballerini lists Britney Spears, Christina Aguilera, and NSYNC among these early artists influencing her. It was not until Ballerini heard "Stupid Boy" by Keith Urban that she decided to delve deeper into country music by listening to albums by Taylor Swift, Sugarland, and Dixie Chicks. Ballerini cites Shania Twain as her greatest influence. She has also performed songs originally recorded by Alison Krauss and sang "Ghost in This House" alongside Krauss at the CMT Artists of the Year Awards in 2018. 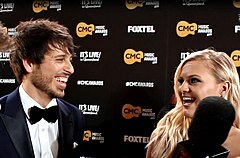 Morgan Evans and Kelsea Ballerini during a Planet Country interview on the CMC Awards red carpet in March 2016 around the time their relationship started. In March 2016, Ballerini began dating Australian country singer Morgan Evans. They became engaged on Christmas Day 2016 and were married on December 2, 2017, in Cabo San Lucas, Mexico. ^ "I Hate Love Songs" did not enter the Billboard Hot 100, but peaked at number 25 on the Bubbling Under Hot 100 chart. "You're Still the One/Any Man of Mine/Man! I Feel Like a Woman!" Hell's Kitchen Herself VIP guest diner at the Red Team's chef's table; Episode: "Hot Potato"
^ Sellers, Morgan. "Artist Interview: Kelsea Ballerini". Thetennesseelife.com. Archived from the original on December 30, 2014. Retrieved December 29, 2014. ^ a b c d e Leggett, Steve. "Kelsea Ballerini biography". Allmusic. Retrieved December 9, 2014. ^ a b c Shelburne, Craig (December 5, 2014). "Next Women of Country: Kelsea Ballerini". CMT. Retrieved June 23, 2015. ^ a b "Would Kelsea Ballerini ever change her name?". 99.5 QYK. April 18, 2015. Archived from the original on June 23, 2015. Retrieved June 23, 2015. ^ Hudelson, Molly (February 9, 2015). "Country singer Kelsea Ballerini talks her debut EP, upcoming NYC show and more". AXS. Retrieved June 23, 2015. ^ Mansfield, Brian (April 5, 2015). "On the Verge: Kelsea Ballerini means it". USA Today. Retrieved June 23, 2015. ^ "Kelsea Ballerini experiences several firsts, headlines SGA Spring Concert". Lumination Network. April 9, 2015. Archived from the original on June 23, 2015. Retrieved June 23, 2015. ^ "Tomorrow's Hits: Lillywood & Robin Schulz, Logic, Kelsea Ballerini". Billboard. October 10, 2014. Retrieved December 9, 2014. ^ "Kelsea Ballerini EP". iTunes Store. Archived from the original on January 9, 2015. Retrieved December 9, 2014. ^ Moss, Marissa R. (June 22, 2015). "Kelsea Ballerini Joins Carrie Underwood in Elite Number One Club". Rolling Stone. Retrieved March 2, 2016. ^ Jim Asker (February 23, 2016). "Kelsea Ballerini Has 'Dibs' on Second Country Airplay No. 1". Billboard.com. Retrieved February 23, 2016. ^ a b Asker, Jim (September 12, 2016). "Kelsea Ballerini Is the First Woman to Top Hot Country Songs & Country Airplay Charts at the Same Time". Billboard. Prometheus Global Media. Retrieved September 15, 2016. ^ "Kelsea Ballerini". Forbes. Retrieved January 5, 2017. ^ Bonaguro, Alison. "Kelsea Ballerini Named No. 2 Forbes' "30 Under 30" List". CMT News. Retrieved January 5, 2017. ^ a b "Nominees". The ACM Awards. Archived from the original on March 8, 2016. Retrieved March 23, 2017. ^ Gugala, John. "Hear Kelsea Ballerini's Wistful New Song 'Legends'". Rolling Stone. Retrieved June 26, 2017. ^ Whitaker, Sterling. "Kelsea Ballerini Announces Title, Date for Second Album". Taste of Country. Retrieved October 4, 2018. ^ "Kelsea Ballerini Chart History". Billboard. ^ "Single Releases : MusicRow – Nashville's Music Industry Publication – News, Songs From Music City". web.archive.org. February 22, 2018. Retrieved January 29, 2019. ^ Despres, Tricia. "Kelsea Ballerini Releasing 'Unapologetically' Deluxe Edition". Taste of Country. Retrieved October 4, 2018. ^ Bein, Kat. "The Chainsmokers Drop Kelsea Ballerini Collaboration 'This Feeling'". Billboard. Retrieved October 4, 2018. ^ Chris Harnick (September 15, 2018). "The Voice Launching The Comeback Stage Companion Series With Kelsea Ballerini as Fifth Coach". E!. Retrieved October 10, 2018. ^ "Kelsea Ballerini's 'Miss Me More' Celebrates Her Independence Day". Taste of Country. Retrieved January 29, 2019. ^ a b Houghton, Cillea. "Hear Morgan Evans' 'Dance With Me,' a Duet With Kelsea Ballerini". Taste of Country. Retrieved January 29, 2019. ^ "61st Annual GRAMMY Awards". GRAMMY.com. December 6, 2018. Retrieved January 29, 2019. ^ Laffer, Lauren. "Kelsea Ballerini Invited to Join Grand Ole Opry". Sounds Like Nashville. Retrieved March 5, 2019. ^ Dukes, Billy. "Kelsea Ballerini Reveals 2019 Miss Me More Tour With Brett Young". Taste of Country. Retrieved January 29, 2019. ^ "Kelsea Ballerini on Her New Album, Taylor Swift & Staying 'Positive': New Music to Know". Retrieved April 30, 2016. ^ "Chart-topping Kelsea Ballerini loves pizza, songwriting". Argus Leader. Retrieved April 30, 2016. ^ Nesvig, Kara. "Kelsea Ballerini Says She'll Never Stray From Her Country Roots". Teen Vogue. Retrieved April 30, 2016. ^ "Kelsea Ballerini - "Ghost In This House" | Live at the Grand Ole Opry | Opry". YouTube. August 10, 2016. Retrieved June 9, 2017. ^ Sarah Michaud (December 25, 2016). "Kelsea Ballerini Engaged to Morgan Evans - See the Ring". People.com. Retrieved June 9, 2017. ^ a b "Kelsea Ballerini Chart History (Top Country Albums)". Billboard. Retrieved October 10, 2017. ^ "Kelsea Ballerini Chart History (Billboard 200)". Billboard. Retrieved October 10, 2017. ^ "Kelsea Ballerini Chart History (Independent Albums)". Billboard. Retrieved October 10, 2017. ^ a b "Discography Kelsea Ballerini". australian-charts.com via Hung Medien. Retrieved January 24, 2018. ^ "Kelsea Ballerini Chart History (Canadian Albums)". Billboard. Retrieved November 14, 2017. ^ a b "KELSEA BALLERINI | full Official Chart History". Official Charts Company. Retrieved January 24, 2018. ^ "American album certifications – Kelsea Ballerini – The First Time". Recording Industry Association of America. Retrieved October 17, 2016. If necessary, click Advanced, then click Format, then select Album, then click SEARCH. ^ Bjorke, Matt (October 10, 2017). "Top 10 Country Albums Sales Chart: October 9, 2017". Roughstock. ^ Bjorke, Matt (April 8, 2019). "Top 10 Country Albums: April 8, 2019". Roughstock. Retrieved April 12, 2019. ^ "Kelsea Ballerini Chart History (Heatseekers Albums)". Billboard. Retrieved October 10, 2017. ^ a b "Kelsea Ballerini Chart History (Hot Country Songs)". Billboard. Retrieved October 10, 2017. ^ "Kelsea Ballerini Chart History (Country Airplay)". Billboard. Retrieved October 10, 2017. ^ a b "Kelsea Ballerini Chart History (Hot 100)". Billboard. Retrieved October 10, 2017. ^ "Kelsea Ballerini Chart History (Canada Country)". Billboard. Retrieved October 10, 2017. ^ a b "Kelsea Ballerini Chart History (Canadian Hot 100)". Billboard. Retrieved October 10, 2017. ^ "American single certifications – Kelsea Ballerini – Love Me Like You Mean It". Recording Industry Association of America. If necessary, click Advanced, then click Format, then select Single, then click SEARCH. ^ "Canadian single certifications – Kelsea Ballerini – Love Me Like You Mean It". Music Canada. ^ Bjorke, Matt (April 18, 2016). "Top 30 Digital Country Singles Chart: April 18, 2016". ^ "American single certifications – Kelsea Ballerini – Dibs". Recording Industry Association of America. If necessary, click Advanced, then click Format, then select Single, then click SEARCH. ^ "American single certifications – Kelsea Ballerini – Peter Pan". Recording Industry Association of America. If necessary, click Advanced, then click Format, then select Single, then click SEARCH. ^ "Canadian single certifications – Kelsea Ballerini – Peter Pan". Music Canada. ^ Bjorke, Matt (March 4, 2017). "Top 30 Digital Country Singles Chart: March 6, 2017". Roughstock. ^ "American single certifications – Kelsea Ballerini – Yeah Boy". Recording Industry Association of America. If necessary, click Advanced, then click Format, then select Single, then click SEARCH. ^ "American single certifications – Kelsea Ballerini – Legends". Recording Industry Association of America. If necessary, click Advanced, then click Format, then select Single, then click SEARCH. ^ Bjorke, Matt (March 13, 2018). "Top 30 Digital Country Singles Sales Chart: March 13, 2018". Roughstock. Retrieved May 3, 2018. ^ "Kelsea Ballerini Chart History (Bubbling Under Hot 100)". Billboard. Retrieved August 14, 2018. ^ "American single certifications – Kelsea Ballerini – I Hate Love Songs". Recording Industry Association of America. If necessary, click Advanced, then click Format, then select Single, then click SEARCH. ^ Bjorke, Matt (September 5, 2018). "The Top 30 Digital Country Tracks: September 5, 2018". RoughStock. Retrieved September 6, 2018. ^ "American single certifications – Kelsea Ballerini – Miss Me More". Recording Industry Association of America. If necessary, click Advanced, then click Format, then select Single, then click SEARCH. ^ Bjorke, Matt. "Top 30 Digital Country Tracks: April 8, 2019". RoughStock. Retrieved April 9, 2019. ^ "Discography Kelsea Ballerini". charts.org.nz via Hung Medien. Retrieved October 26, 2018. ^ "Discography Kelsea Ballerini". swedishcharts.com via Hung Medien. Retrieved October 26, 2018. ^ Bjorke, Matt (February 20, 2019). "Top 30 Digital Singles: February 20, 2019". RoughStock. Retrieved February 27, 2019. ^ "They Don't Know by Jason Aldean". iTunes Store (US). Apple Inc. Retrieved September 9, 2016. ^ "CMT : Videos : Kelsea Ballerini : Love Me Like You Mean It (Acoustic)". Country Music Television. Retrieved December 9, 2014. ^ "CMT : Videos : Kelsea Ballerini : Love Me Like You Mean It". Country Music Television. Retrieved March 12, 2015. ^ Wuokko, Staci (October 22, 2015). "Watch Kelsea Ballerini Travel Cross Country in 'Dibs' Music Video". radio.com. Retrieved October 24, 2015. ^ Schillaci, Sophie (March 31, 2016). "EXCLUSIVE: Kelsea Ballerini Debuts 'Dream Video' for 'Peter Pan' – With a Very Hunky Co-Star!". Entertainment Tonight. Retrieved April 2, 2016. ^ "CMT : Videos : Kelsea Ballerini : Yeah Boy". Country Music Television. Retrieved December 28, 2016. ^ "Legends - Kelsea Ballerini". Vevo. Retrieved July 5, 2017. ^ "Carrie Underwood Leads 2015 CMT Awards Nominations". Rolling Stone. Retrieved December 10, 2015. ^ a b "Eric Church, Little Big Town Lead 2015 CMA Awards Nominations". Rolling Stone. Retrieved December 10, 2015. ^ "Taylor Swift Leads 2015 American Music Awards Nominations | Billboard". Billboard. Retrieved December 10, 2015. ^ "Kelsea Ballerini to Receive 'Rising Star' Honor & Perform at Billboard's Women in Music | Billboard". Billboard. Retrieved December 10, 2015. ^ "Nominees". The ACM Awards. Archived from the original on March 8, 2016. Retrieved March 2, 2016. ^ LTD., BubbleUp,. "Academy of Country Music | ACM News". www.acmcountry.com. Retrieved November 20, 2016. ^ a b "Nominees – 2016 CMA Awards". 2016 CMA Awards. Retrieved November 20, 2016. ^ "2016 Nominees | American Music Awards". American Music Awards. Retrieved November 20, 2016. ^ "The Grammy Awards 2017: Full List Of Nominees". The Grammy Awards. December 21, 2016. ^ a b "2017 Radio Disney Music Awards: complete list of nominees". ABC News. March 3, 2017. ^ "2017 Radio Disney Music Awards: complete list of nominees". ABC News. March 3, 2017. ^ "Reba McEntire and Toby Keith to receive Special Awards from Academy of Country Music". News OK. May 30, 2017. Retrieved June 9, 2017. ^ Ceron, Ella. "The Pretty Little Liars Were ALL Nominated for the Same EXACT Award". Teen Vogue. Retrieved June 20, 2017. ^ "CMA Awards 2017: Miranda Lambert Tops List of Nominees". PEOPLE.com. September 4, 2017. Retrieved September 6, 2017. ^ Freeman, Jon (March 1, 2018). "Chris Stapleton, Thomas Rhett Lead 2018 ACM Awards Nominations". Rolling Stone. Retrieved April 15, 2018. ^ "2018 RDMA Winners". Retrieved February 2, 2019. ^ "Here Are All the Winners From the 2018 Billboard Music Awards". billboard.com. Retrieved May 22, 2018. ^ Atkinson, Katie. "Here Are All the Winners from the 2018 CMA Awards". Billboard. Retrieved February 2, 2019. ^ "Nominees". GRAMMYs. Retrieved December 8, 2018. ^ "Kelsea Ballerini Announces First Headlining Tour Dates". Taste of Country. Retrieved November 20, 2016. ^ "Kelsea Ballerina Announces: The Unapologetically Tour". Kelsea Ballerini. Retrieved May 22, 2017. ^ "The Miss Me More Tour". Kelsea Ballerini. October 29, 2018. ^ "Kelsea Ballerini Talks Touring, Tats, Taking "Kelfies" and More". Nash Country Daily. Retrieved November 20, 2016. ^ "Dan + Shay Announce 'Just The Right Kind of Crazy' Tour". radio.com. Retrieved November 20, 2016. ^ "Rascal Flatts Announce Rhythm and Roots Tour". CMT News. Retrieved November 20, 2016. ^ "Thomas Rhett Announces 2017 Home Team Tour". ^ "Lady Antebellum: You Look Good World Tour Upcoming Shows". Live Nation. ^ "Keith Urban Pinpoints Why He Chose Kelsea Ballerina for the Graffiti U Tour". Sounds Like Nashville. Retrieved June 18, 2018. ^ "Kelly Clarkson Announces Meaning of Life Tour". Broadway World (Press release). September 14, 2018. Retrieved September 14, 2018. ^ "Kelsea Ballerini to co-host the CMC Music Awards | Country Music Channel on Foxtel". Country Music Channel. February 15, 2016. Retrieved November 6, 2018.